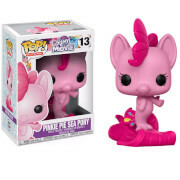 Your favourite, and not coincidentally the only, unicorn disc jockey pony from My Little Pony: Friendship is Magic has been mysteriously transformed into Pop! Vinyl form with the MLP DJ Pon-3 Pop! Vinyl Figure! Standing 3 3/4-inches tall, the party-starting pony looks true to form, and isn't that all you really need to know? When you see just how cool the MLP DJ Pon-3 Pop! Vinyl Figure looks you'll want to collect the rest in the My Little Pony line from Funko!